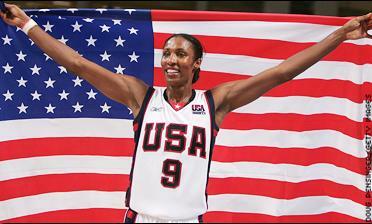 Lisa Leslie and Team USA: 25 straight Olympic wins. Led by Tina Thompson, U.S. women's basketball became the latest American golden girls Saturday, capturing a third straight gold. On the men's side, the U.S. pulled it together for bronze while Argentina beat Italy for the gold. Dawn Staley won't be Team USA's point guard forever. But she's making sure the position is in good hands. For the first time, a team representing Africa won a game in women's basketball. Nigeria's 68-64 win over South Korea on Tuesday snapped the 0-18 mark as the team finished 11 of 12 teams at the Games. They're struggling with selfishness on the U.S. men's basketball team. And it all starts with Larry Brown. Lesson learned, but can U.S. keep learning? The memory of the painful loss to Puerto Rico helped Team USA survive against Greece, but there is still plenty of work to do. The coach of the Serbia-Montenegro basketball team has been told to respect Olympic guidelines and avoid further outbursts. If the invincibility of the U.S. in basketball had been shaken before these Olympic Games, it's been shattered now. Shocking? Maybe not, but Team USA's loss to Puerto Rico proves how difficult it is to build a team. The U.S. basketball team lost 92-73 to Puerto Rico on Sunday, only the third Olympic defeat ever for the Americans. Team USA's co-captain Allen Iverson has a nondisplaced fracture of the right thumb. Manu Ginobili's off-balance shot gave Argentina a thrilling 83-82 victory over Serbia-Montenegro on Sunday. Though they're still the favorite, the U.S. women had barely more than a week together before landing in Athens. The U.S. women's basketball team will march into these Olympics with a limp. Lisa Leslie and Sue Bird led the U.S. women to a 68-38 victory over France on Sunday at the Spanish International Tournament. Center Yao Ming scored 23 points in leading China's Olympic team over Sweden 87-63 in an exhibition game. Despite an easy victory against the WNBA All-Stars, members of the U.S. Olympic team know they have some things to work on before the Athens Games. Unlike her Team USA teammates, Yolanda Griffith took the 'back road' to success. Co-captain Allen Iverson will endure heat for being late to a meeting that got him suspended, but it should not lessen his Team USA stature. Team USA is 50-0 in Olympic basketball. But without its stars in Athens, the team is not about to be called dream. For Larry Brown, beating the Lakers in five might be easier than winning gold in Athens. Marc Stein's Slams and Dunks, Team USA edition. Those expected feuds among members of Team USA? Even LeBron and Carlos are playing nice in camp. Team USA assistant and Spurs coach Gregg Popovich admitted he "hated it, personally" when Shaquille O'Neal was traded from the Lakers to Miami. The WNBA and fans in the U.S. are lucky Australian Lauren Jackson found a second home in Seattle. Detroit's Ruth Riley, the 2003 WNBA Finals MVP, has been named to the 2004 USA Basketball Women's Senior National Team. The prospect of taking a month off to rest her injured right foot sounds appealing to Sheryl Swoopes, a two-time Olympian. Brian Church, our Athens Insider, offers a little slice of what life's like in the host city. And he swears all of it is true. With the Games barely weeks away, the Greek Olympic Committee must market this puppy as never before. Women's hoops has come a long way since '92. Dawn Staley, Lisa Leslie and Sheryl Swoopes have been there from the start. It has already been a busy year for Aussie Lauren Jackson, and things will only get more hectic in Athens. In 1896, Athens had just about 100,000 people. Today, greater Athens is a concrete carpet of more than 4 million people. Did the U.S. men peak a year ago? The men's basketball gold medal is more up for grabs than it has been in 16 years. There are professional basketball players eager to go to the Olympics. Their names are Staley, Swoopes, Leslie and Taurasi. Longtime NBA coach becomes first American to coach Chinese national team. Carmelo Anthony will be going to Athens with Team USA but Ben Wallace and Rip Hamilton will not. The NBA's best players could be fearing something else in Athens: the possibility of losing. Officials promise there will be safe Games in Athens this summer. The threat of terrorism has some athletes concerned for their safety, while others still look forward to competing in Athens. ESPN.COM'S 2004 SUMMER OLYMPICS: Complete coverage from Athens. ESPN.COM'S 2002 WINTER OLYMPICS: Look back at the best Winter Games performance by the United States. ESPN.COM'S 2000 SUMMER OLYMPICS: From the opening ceremonies to the final gold medal.